I love this breed too Deb from TN. I love the way he stands up to watch TV too, when he smells something good in the Kitchen & when I pick him up from the Groomers. He also jumps so high I'm afraid he'll jump over the counter. Cody you are adorable!! I absolutely love when they stand up like that! Saylor Jane does it all the time. My favorite is when she stands up to watch something on tv. I can't help but laugh. I love this breed. He looks like a very lucky little guy. We just got our little girl, Maddie, yesterday. She has a lot to teach us! Glad to be part of the community! I love this pic. He really enjoys life !! 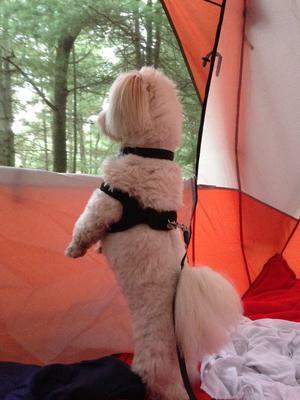 I just love your pic Cody, standing up guarding your humans I am sure. Hope you kept them safe and enjoyed your camping vacation. What a good boy and so handsome!